It's been a while since my last entry. Thought I'd just throw some stuff out there. I'm very excited that baseball spring training has started. Once again I will cheer on the Reds and hope that they can make the playoffs. It should be an uphill battle with all the young talent and the tough division that they are in. There is some talk of doing a road trip, to see some games. Detroit, Chicago, Milwaukee, Cincinnati, Cleveland, Philly, Baltimore, and New York have all been discussed. Any suggestions?? I just read that Rachel Bilson got engaged, there goes my chances. What does Hayden Christensen have that I don't?? I finally watched the premier of Dollhouse last night. It sat in my DVR for a couple of days, but it was worth the wait. It's kind of got that Christian Slater, My Own Worst Enemy twist to it, but I'm intrigued by it. I personally think that it would do better teamed up with Fringe on Fox than Terminator: The Sarah Connor Chronicles. But FOX does not pay me to make the schedule. I finally got the book that the new HBO mini-series, the Pacific, is based on. It's a pretty good book and I'm actually surprised that it took this long for someone to adapt to a movie or mini-series. If you are into WWII I would suggest pick it up, its called "With the Old Breed" by E.B. Sledge. Well that is about all I've got for random ramblings. My friend sent me a video link the other day and it was one of the most glorious things I've ever seen. It was a story of a restaurant that prides itself on being bad for you. In today's health conscious society its nice to see something refreshing as that. 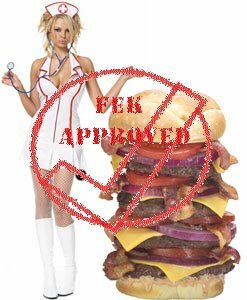 The Heart Attack grill is located in Arizona, its got huge burgers, waitresses in nurse outfits and a french fry buffet. When you add those things together I have to think that it should equal total success. The place doesn't serve anything diet or light, no diet coke, no bug light. You get a bracelet like you were being treated at the hospital and they even wheel you out in a wheel chair when its all done. I would love to hear if anyone has ever been to one or knows someone who has been to one. I think it might make for a nice little side trip if I ever have a reason to go to Arizona. Ok so we now have a stamp so we can approve all things great enough for this site or that we recommend. So with the beginning of the year Maxim came out with its new A-List stars, that are very well established, and will cement themselves in the eyes of the public. 10. G.I. Joe: The Rise of Cobra (movie) Decent cast Brendan Fraiser, Dennis Quaid, Rachel Nichols and Joseph Gordon-Levitt. If its even close to Transformers it will be a great movie to watch this year. 9. The Pacific (HBO mini-series) From Tom Hanks and Steven Spielberg comes a complimentary piece to Band of Brothers. With those two at the helm how can this not be another great WWII installment. 8. Kat Dennings (actress) Yes Nora of Nick and Nora, what will she have in store for us in '09? According imdb.com she has 4 more movies in production, completed, filming or post production. 7. New York Yankees (MLB team) With a brand new stadium to open this year and a huge bump in their payroll, will they bring home the World Series ring? 6. The Office Super Bowl Episode (NBC series) The question is will the all-star guest cast hurt this show? It's very tricky to have huge guest stars on an ensemble show. Hopefully the series keeps its magic and doesn't force anything by having these stars on. 5. Astellaway & Hey Monday (Bands) This is going to be the year that both of these bands explode. Hey Monday has a slight jump on Astellaway but its about time that the whole world new who these bands. 4. Scubs (NBC Series) Will this truly be the last year for Zach Braff and the gang at Scrubs? Or will they do a rotating cast like ER and keep it going? 3. I win the lottery (a daydream)I become independently wealthy. In turn I dump most of my winnings into www.fatEMOkid.com and branch out to other forms of media and expand the clothing line. 2. Netflix. (A Video Rental Company) Netflix takes over the world. Cable becomes obsolete and become a la carte. 1. Eliza Dusku (Actress) With a new series by Joss Whedon coming to Fox and a few more movies, this could be the year for our favorite rebellious "Bring it on" cheerleader. As you know I enjoy the show Arrested Development, and I was following up on the rumor that a movie was going to be made, I made a great discovery. According to multiple websites the movie is a go. Jeffery Tambor is quoted as saying that the producer/director/writer Mitch Hurwitz called him and told him it was a go. According to Keith Olberman on Countdown, David Cross also received the same phone call. Ron Howard is quoted on Maxim.com as saying that the movie is only waiting for a script. I've been waiting for this ever since the show went off the air. I've ritually checked imdb.com for updates, and its finally been updated. Bring on the Bluth's in '09!!!! !